Starting a YouTube channel is an exciting, yet overwhelming task. It may sound straightforward at first, but nowadays you are competing with channels that have massive amounts of resources and teams of people working to dominate the market. If you want any chance at getting your videos seen, you need to take a smart, strategic approach to your beauty guru channel. 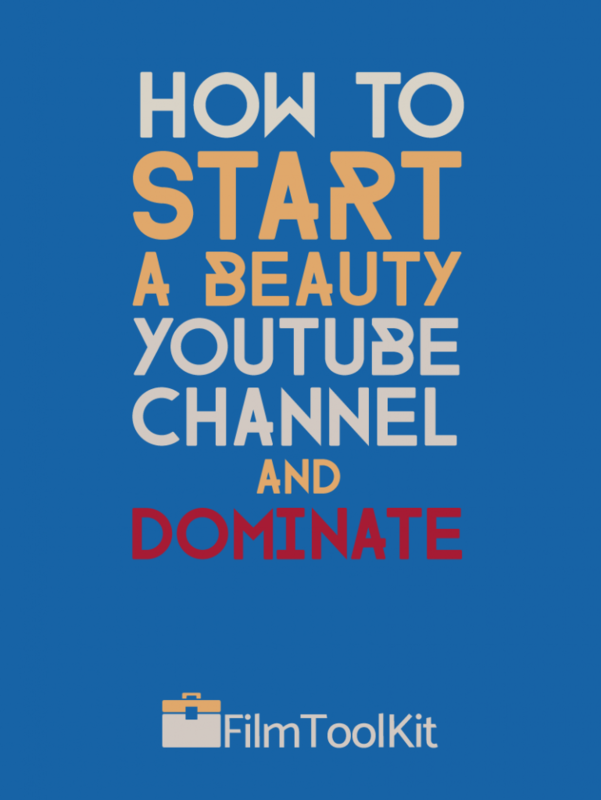 We’re going to teach you how to start a beauty YouTube channel in the most efficient way possible. From selecting the right gear, to establishing yourself and attracting subscribers, this is a step by step guide filled with innovated tips most people aren’t utilizing. It’ll still be up to you to create high-effort, valuable content, but we will be providing a road map that will maximize your chances of success. Launching and running your channel can be boiled down into three simple steps. Everyone these days has access to some simple tools to start creating content. However, if you really care about being a successful YouTuber, it is wise to begin investing in some proper equipment. The equipment you choose will vary with how serious you plan on taking your channel. Here are some recommendations from us on what gear will help the most for your channel, ranked from most important to least important. In all things film and media, the power of lighting can often be grossly underestimated. All professional footage is shot with meticulously planned lighting, and it is the only way to keep your footage from looking ugly, grainy, and blurry. A properly lit cheap camera can often produce better images than an expensive camera in the dark. If you’re a beauty guru, your appearance on camera is the basis for your entire authority. If you aren’t looking as good as possible when you turn the camera on, people are not going to trust you as a beauty authority. What we’ve determined time and time again on this site is that ring lights are by far the best choice for make-up YouTubers. They properly expose you while creating a beautiful soft glow around your edges. The ring shape causes a neutral zone in your faces center, de-emphasizing blemishes, and overall they are very easy to set up and use. We put together a guide to pick the best ring light for you that goes into more depth regarding what exactly the pros and cons of using a ring light are. Softbox lights and umbrella lights will also get the job done right, are a bit cheaper, and actually have some benefits over ring lights. If you already have other lights, or are interested in other lighting options aside from ring lights, check out our guide to lighting options for YouTube videos. Believe it or not, if you have a limited budget and no DSLR, we recommend shooting your videos on your smartphone camera. Newer phones like the iPhone X and the Google Pixel have top-tier cameras that can even outclass some low-end DSLRS. Spend your money on the other things we recommend. Here is a video made by YouTuber Fun For Louis in which he does his daily vlog using the Google Pixel. While you won’t be able to achieve the same quality in terms of depth-of-field and overall fidelity, I think the results are very impressive. If you don’t already own a high-end smartphone, the best choice for those looking for the most bang for your buck would be to go with a camcorder. We recently did a review of 5 excellent camcorders for YouTube. We recommended one for every different budget possible, and are confident they are all excellent choices. Of course, DSLRs will always outperform camcorders in nearly all categories. We haven’t yet taken the time to research and recommend the best DSLRs, but it is commonly known that the Sony A7s2 and the Canon Ti Series are both very popular among both fledgling and veteran beauty YouTubers. Now, if you’ve purchased some sort of camcorder for YouTube, chances are your microphone is pretty decent. You’re not going to be blowing anyone away with your quality, but you will far exceed the quality of webcam microphones and DSLR mics. As far as microphone options go, you’ll have about three choices that may suit you depending on your preferences. This is the choice for the vast majority of aspiring make-up gurus. A desktop microphone is a simple plug-and-play device that captures high quality recordings of your voice. If all of your content is being either voiced-over or captured at your desk, a desktop microphone is an extremely effective and cost efficient choice. The Blue Yeti desktop microphone is extremely popular choice that you can find in the homes of millions of YouTubers and streamers. To see our recommendations for the best desktop microphone, as well as a more thorough demonstration of their pros and cons, check out our in depth guide. Note: Be aware that the shotgun and Lavalier microphones will likely use an XLR or Line connection rather than a USB one. You will need either an audio interface, DSLR, or external audio capture device in order to use them to record sound. Shotgun microphones will require a little more effort, and a bit more money, but are much more versatile than desktop microphones. The Videomic GO from Rode is a relatively inexpensive shotgun mic used by tons of YouTubers. Shotgun microphones are device you attach to either the top of your camera, or to a boom pole that provide top-tier directional sound. They come in all price ranges, do everything a desktop microphone can do, and a whole lot more. These are perfect for vlogging as they will essentially replace the low quality in-camera microphone with a higher one, and they reject noise from the sides. They feature a cardioid pickup pattern meaning whatever is directly in front of it is exclusively captured. If you intend to produce videos outside of your bedroom, this should be the choice for you. For more information on Shotgun microphones, as well as a complete guide on the best mics for all price ranges, check out our guide. The Sennheiser EW 112P is very popular among Vloggers, and is the industry standard for video production. If you are planning on having shooting situations where you need to capture your voice while farther away from your camera, this is the only way to do it. They are also great for interviews, and capturing outdoor activities. In most situations this is the best possible solution for capturing your voice, the only drawback is that it is the most expensive. For more information on wireless lavaliers, as well as a complete guide on the best Lavs for all price ranges, check out our guide. As a beauty guru, you’ll probably be able to get by for a while using iMovie, Windows Movie Maker, or some other free software. However, these programs can be inefficient, lack key features, and are overall quite clunky compared to premium options. If you are planning on taking YouTube seriously, we suggest investing in professional editing software. In a recent article, we discussed why Adobe Premiere is the best editing software available for those doing YouTube let’s plays. We think if you’re a beauty YouTuber, you should definitely invest in Adobe premiere as well. The software is easy to learn, very versatile, and relatively affordable. We further discuss the many benefits of Adobe Premiere, as well as recommend some other great editing software options in the aforementioned article. For less than 20 bucks a month you gain full access to Adobe Premiere, and if you’re a student, you’ll get the rest of the creative suite at that price. This includes Adobe Illustrator, After Effects, and Photoshop, both of which are used very heavily by successful YouTubers. Every truly great content creator puts a ton of planning into their videos. Simply having an idea and sitting in front of the camera might work sometimes, but consistent high quality content requires dedication and planning. These tips can be easily applied to any YouTube channel, so don’t be afraid to share this info with your YouTuber peers. Our advice to all YouTubers is to consider who your target demographic is when planning your branding strategies. This refers to your thumbnails, your social media presence, and the aesthetic of your channel as a whole. As a beauty channel, you should be targeting females age 13-30. Here are a few ways to do that. 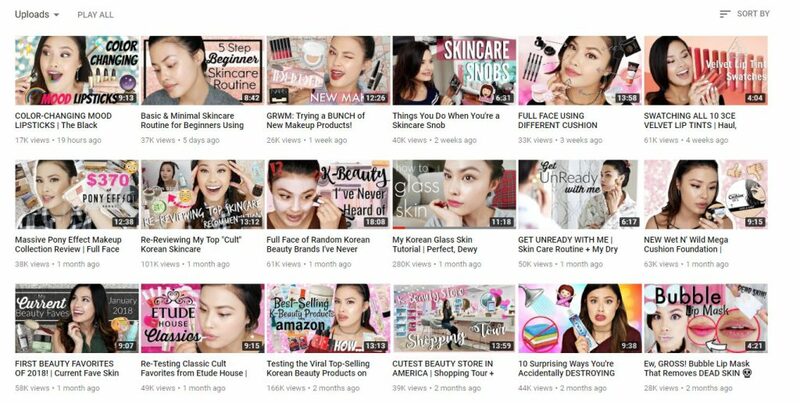 YouTuber The Beauty Breakdown is a great example of engaging, attractive thumbnails that both accurately represent her content, as well as appeal to her target demographic. As a beauty guru, appealing to your audience with your branding is very straightforward. Utilize light, pastel colors, pink, artistic fonts, and add stills of yourself to the thumbnail where you look as pretty as possible. Consider designing a banner for your channel that fits your personality, and get a logo made which is easily recognizable and can be used across all of your content platforms. Here are some great examples of artistic fonts as well as download links so you can get them for free! To maintain consistency, it’s a great idea to implement these fonts throughout your videos as well. Your Instagram feed should be supplemental content curated specifically for the platform. 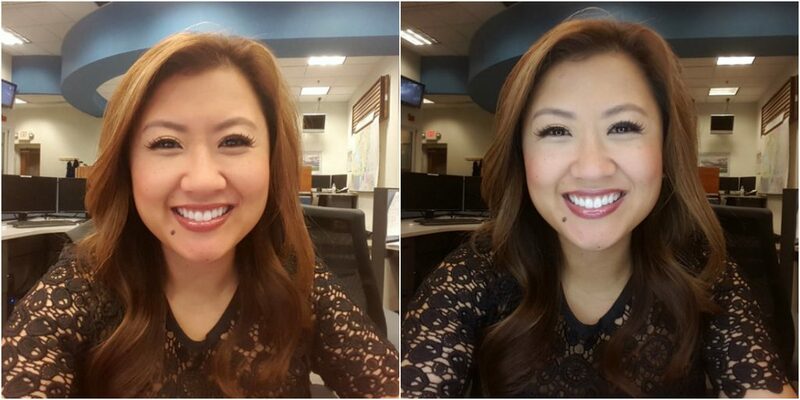 Consider creating pictures of daily beauty tips, or just upload high-res photos of your favorite looks. You can promote your content via your bio, or through Instagram stories, but your profile should be well maintained enough to attract attention on it’s own. Try to provide 3-4 pieces of valuable content for every promotional one. People want to follow interesting content, not promotional shills. As a YouTube beauty guru, if you want to hold an audience’s attention, you will need a steady regular stream of videos that people can expect from your channel. While uploading one-off videos is great, if you plan to have longevity, you will need to create a few series of videos that you can always draw from. If you’re struggling to come up with original ideas for this, we have put together an extremely thorough guide to the best YouTube video ideas for Beauty Gurus that ensures you will never run out of original content. Give it a read and come back here. Pushing out 3-4 videos a week means you should be filming more videos than you are posting. You should have a release schedule planned in advance, and plenty of videos in reserve so that you have the ability to take time off. Consistent content is one of the easiest ways to build an audience. In addition to planning a long-term game plan of what content you’re going to be making, you should diligently prepare each individual video as well. You don’t need to write out a full blown script for every video, although it does help. What’s more important is that you prepare some outlines that cover topics you would like to cover and points you would like to make. Consider what questions your audience will have after watching your video and answer them in advance. Think about how you can relate other videos to this one and interlink them, similarly to how we have been doing in this very article. Besides equipment investments, the only thing standing between you and the professional footage you look up to is patience. When it’s time to shoot, don’t just plop the camera down anywhere. Carefully consider your framing and composition to make the footage as aesthetically pleasing as possible. Take your time to adjust your exposure and focus. Pretend you’re being paid a lot of money to produce a professional video for someone else – that should help keep you from getting lazy. If you import all your footage into your editing software and you see that it all turned out blurry or overexposed, start over and shoot it again. If you want others to take you seriously, you need to take yourself seriously too. Your first step should be to read our comprehensive guide on how to get your YouTube video seen. This guide has dozens of really effective, creative tips on how to run your channel in a manner that will have people dying to watch your content. The article features very in-depth information about how to structure each individual video to encourage retention. Here’s an abridged version of the tips if you are lazy, but we really recommend reading through the whole article. Focus on collecting minutes watched over views or subscribers. Put the juiciest content in the middle, and be as thorough as possible. Encourage engagement with your audience, prompt discussions, run contests, etc. Collaborate with channels that have a similar demographic. Become a part of beauty guru communities. Monitor which series are the most successful and concentrate on those. There’s a ton of great advice in there – all those tips are broken down in detail with examples and everything.